Since 1925, Niagara Falls has been illuminated at night with brilliant spotlights that transform the rushing waterfalls into a beautiful display of colour and light. And now the Niagara Falls Illumination Board has improved upon this amazing 91-year tradition with the addition of brand new energy-efficient LED lights that are twice as powerful as the old lights and use about 60% less energy to run. The Niagara Falls Illumination Board houses the 100 panels of new LED lights in the Illumination Tower next to Queen Victoria Place and from a spot in the Niagara Gorge. The new lights are much brighter and less hindered by the thick mist created by the waterfalls, which ultimately enhances the illumination experience. 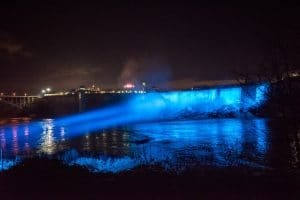 Niagara Parks and the Niagara Falls Illumination Board will also continue to light up Niagara Falls in special colours in order to support and raise awareness for a wide range of non-profit and charitable organizations. The schedule for these special illuminations along with the regular illumination schedule can be found on the Niagara Parks. Visitors and locals alike can take in the illumination of Niagara Falls every evening as the lights will be on from 5pm to midnight from now until January 31st, with the exception of New Year’s Eve when they will be lit until 1am.